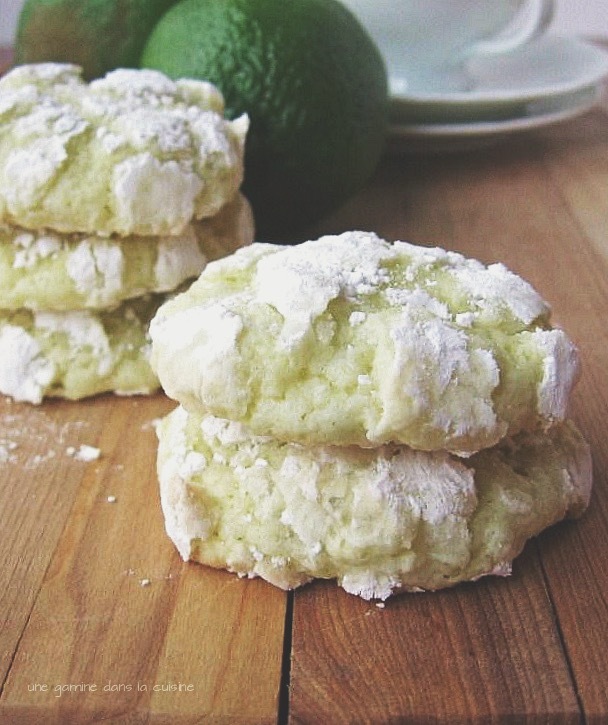 Is there anything more lovely than the fragrant marriage between almonds & limes? Maybe; especially if you're a chocolate fan. But sometimes you need something refreshing, perky and light. These cookies are fluffy, edible pillows of bliss. They receive their almond love via a healthy dose of extract, but the next time I make this recipe (and there shall be a next time!) I might use almond meal in place of cake flour. Whilst preparing the cookies, the limes spoke to me in their adorable limey way; they said they'd fallen madly in love with almonds + wished to see more of them in the future. Who am I to deny a cookie, or true love? In a separate, large mixing bowl, combine the sugar and lime zest. Using your fingertips, rub the zest into the sugar until moist and fragrant. Add the butter. Beat on medium speed for 1-2 minutes until blended. Add the eggs, one at a time, beating for about 1 minute after each addition. Add the almond extract, and beat for another minute. On low speed, add the flour mixture. Beat until just combined (just long enough for the white streaks of flour to disappear). Grab a large rubber spatula and give the dough a few good turns. Cover the bowl and refrigerate for 30 minutes. Preheat the oven to 350 F. Line baking sheets with parchment paper. Sift the confectioners' sugar into a large, shallow bowl. Place each coated cookie on the parchment lined sheet, leaving about 2-inches of space between each one. Remove the sheets from the oven and allow the cookies to rest for about 3 minutes before carefully transferring them to a cooling rack. So tempting looking and delicious sounding! What an awesome treat. I love the name of these cookies! They perfectly reflect the look of these cookies..and remind me of Christmas and the cold! What a lovely taste they would have too. Good work Valerie! I have never heard of lime and almond together. Hmmm, very intriguing. I adore almond, and that's a fact. 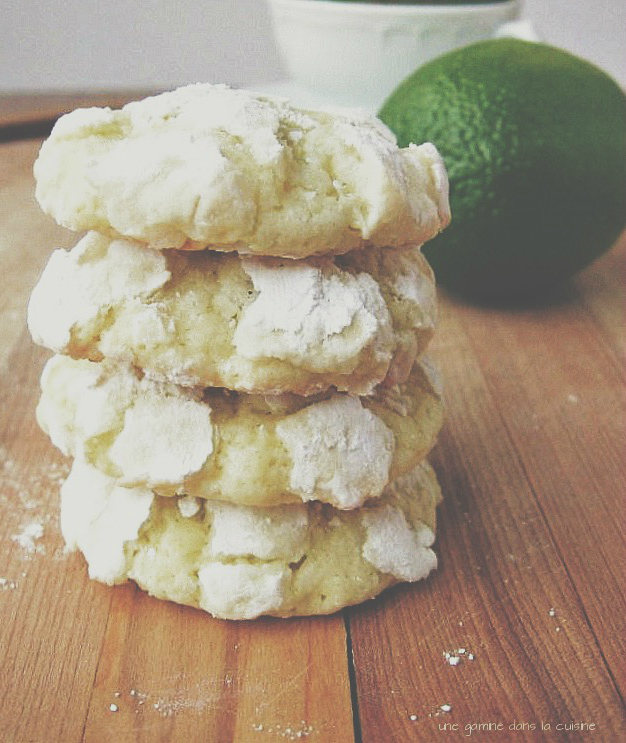 I wonder, how would these taste without the lime, and just some pure almond extract? They sound really good. I always have lots of lemons and limes around too. These are perfect--like chocolate crackles without all that pesky chocolate! I absolutely adore lime!! Love the "glacier" description. These are for me, for sure!! 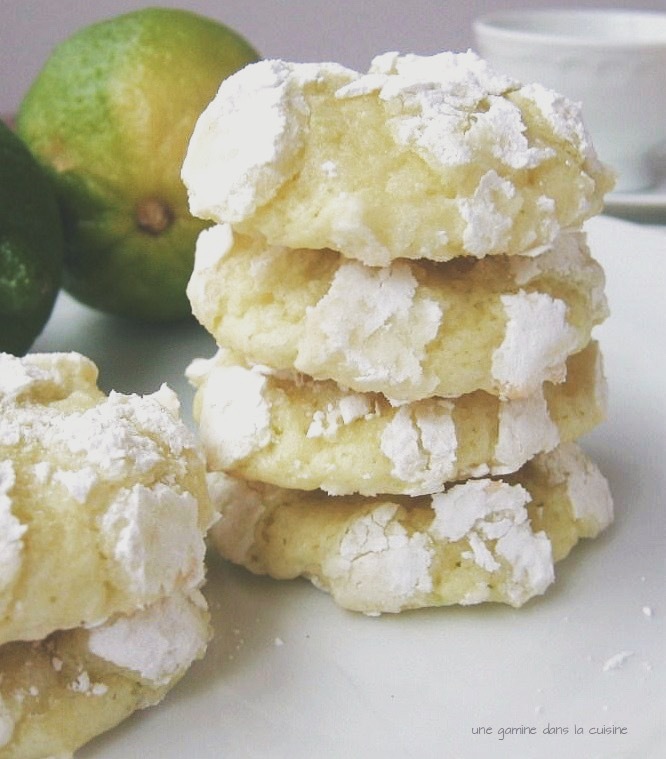 I'd also bake with lemons and limes any time of the year. These cookies look amazing. And they're so pretty! They DO look like fluffy, edible pillows of bliss! Stunning! Those cookies look so delicate and delicious. Yum! I just love your writing, too. Always a treat to read your posts. You have a gift for baking and prose! These are stunning. I love the look. Bet, I would love the taste more. These just finished baking in my oven, and my kitchen smells devine. I have been baking for 3 days strait, and this recipe was my favorite by far. Simple, fragrant, light, and I'm sure soon to be delicious! Hope you have a very Merry Christmas! are these cookies chewy? Also, after they are ball shaped, do place them as ball shaped on the parchment to bake or flatten them out a bit? These cookies are on the chewy side, with a slight crisp around the edges. As far as the dough, just place the coated balls directly onto the sheets without flattening...because, if I remember correctly, I didn't want to mess up the fragile coating of confectioners' sugar. I also brought them into work and everyone raved about it, and I'll be making these again for the next Hsinru Social. Keep up the great work! Oh and I linked you for the recipe too! Hi Valerie! Is it ok to prepare the dough early in the day and leave it in the fridge?